Another catch-up post is in order. I'm just back from 2 weeks in Brisbane, visiting family. Three visits in one year! My MIL's twin sister died, just before their 89th birthday, and we thought seeing Thomas and Isla would cheer Mum up. It was a hectic time, organising get-togethers and navigating city traffic, but it was well worth it. 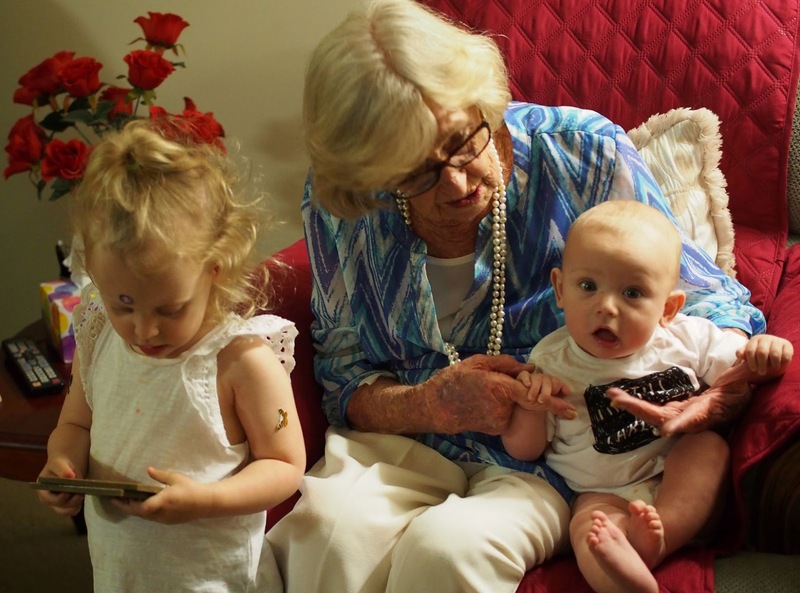 Isla really enjoyed being with the Brisbane and New Zealand family members again, and Thomas was much admired. We stayed with DS Rhys, in an inner city suburb; his apartment is very secure, with fobs and clickers to operate doors and lifts and the garage. I managed to deal with all that without losing anything or locking myself out of anything, but it made me long for my uncomplicated life back here. His apartment is all modern and sleek, which makes a quilt even important, something to soften the edges and provide a bit of home comfort and love. I quilted a top for him, and brought it with me, as I thought it was safer than posting it. He has a quilt I made him when he was 15, and he's loved it to pieces. 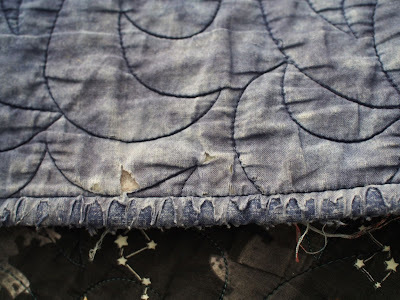 The binding is fraying; only the top layer of the double-fold binding, but it still needs to be replaced. The fabrics are very faded and worn, I'll have to go over it and repair any weak spots. 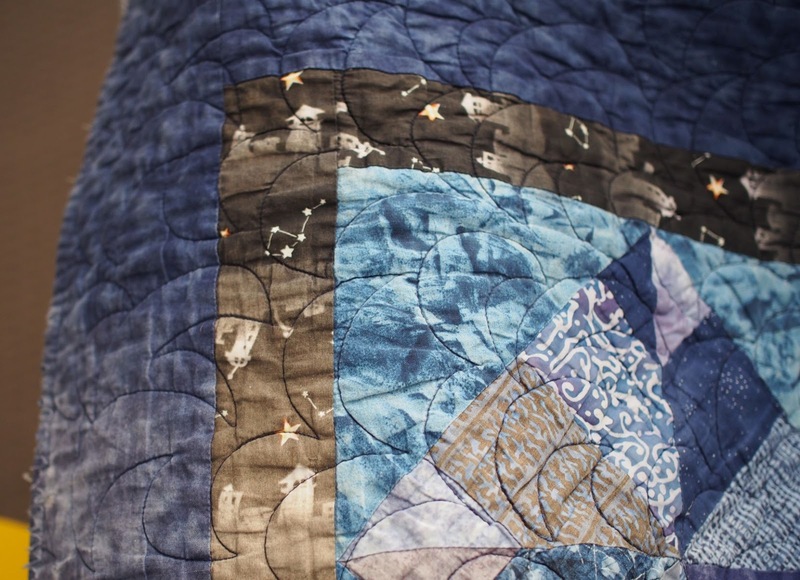 But I'm so pleased that this quilt has kept my son warm and comforted through the last 15 years, and that whenever he wraps himself up in it, he's reminded that I love him. I told him that the more he uses the new quilt, the softer and more familiar it will become, and in a little while he'll have his old friend back, rejuvenated for another 15 or so years. I call that a quilting success story. How wonderful you got to visit family and come back to peace and quiet. 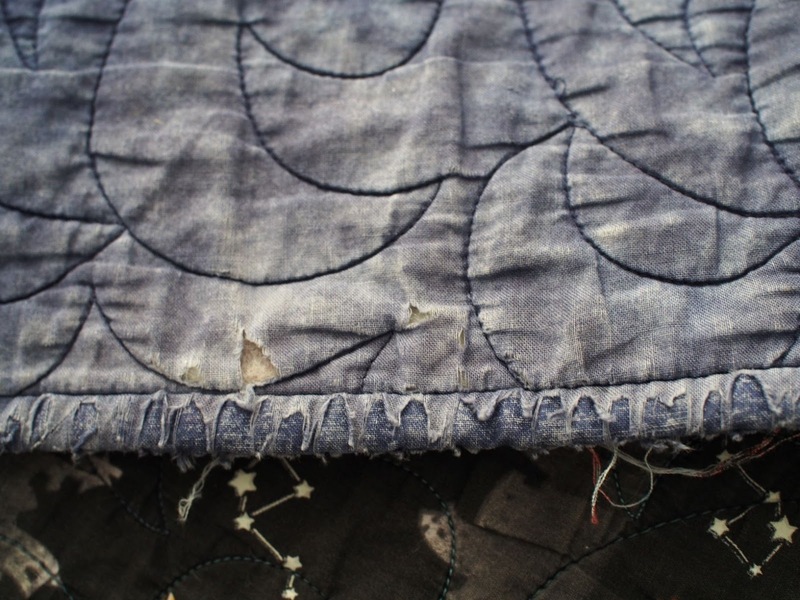 Your son's new quilt is simply wonderful, all scrappy with such serene colors. I'm sure he'll appreciate it as much as the old one, if not more so. 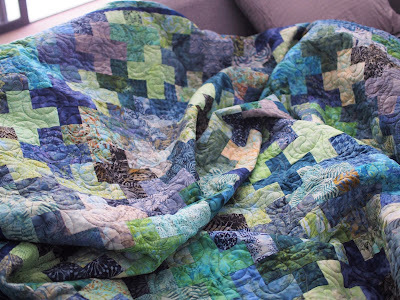 Lovely post, lovely quilts, good to see you are OK. I once gave a quilt to a friend who had just had a new baby. She did the usual "non-quilter" thing of saying it was far too nice but I explained it was MEANT to be sicked on, and all the other things which a new baby would deposit on the quilt! I also told her that to put it in a cupboard "because it was too nice to use" would be an absolute waste and the very best compliment she could pay me was to come back in a few years time and say "err, we've worn it out!" I want every quilt I make to be that loved. Agree, definitely a success if he worn the quilt out. But your a better woman than me, I would have chucked the old one when I gave him the new! I say that now but I know as a mother you do things for your kids you would not do for other people!